The current decade is not only significant for automobile manufacturer for commercializing autonomous vehicles. It also witnesses the landmark achievement of autonomy in the ride-sharing industry. Artificial intelligence laid the foundation stone to achieve these feats. Machine intelligence in transportation is a crucial component of future urban mobility. The transportation monetization with AI will be valued at $750 billion by 2030 if it continues to grow at the current rate. Inexperienced researchers, as well as entrepreneurs, should know the steps that enable the autonomous cars to drive without human assistance. Various components integrate to achieve a common milestone of uninterrupted mobility. A completely autonomous vehicle is equipped with multiple sensors intended to achieve distinct tasks. The processors analyze the data from various sensors to enable smooth movement. This data integration occurs in real-time to allow a vehicle to make swift and appropriate decisions. Most of the current self-driving vehicles primarily use a single camera mounted on the windscreen. However, many auto manufacturers are introducing multiple cameras to increase visibility. The analysts believe that single camera version may work well on highways with less congestion. However, the urban downtowns and narrow pathways require far greater visibility. Latest models of autonomous vehicles use a combination of four to six cameras covering 360° around the vehicle. Computer Vision (CV) algorithms power these cameras to detect objects ahead and around them. The CV libraries use various machine learning techniques to detect the objects. The developers can customize the libraries to make a distinction between different objects. They need to predefine the region of interest (ROI) before algorithm undergoes supervised training. RADAR is the current standard for assessing the distance and volume of objects around a vehicle. It uses medium and short-range radio waves which share the information of nearby objects after striking them. The vehicles equipped with RADAR no longer require side-mirrors because any vehicle can estimate distance of other cars by using radio waves. Apart from lane changing assistance, the RADAR also enables the vehicles to maintain a safe distance, and park efficiently. Currently, machine learning in transport management works in conjuncture with 24-GHz RADAR. However, 122 GHz technology is in the final testing phase and may soon be available by early next year. Besides, observers expect monolithic System-on-Chip technology to make way into the industry to integrate baseband functions along with RADAR. While RADAR is already increasing the efficiency of self-driving vehicles, the LiDAR sensor set to completely transform them. Instead of radio waves, LiDAR uses laser light. Since the wavelength is relatively much shorter than, the system should comprise an intensely sensitive receiver apart from the transmitter. The shorter wavelength ensures greater frequency which allows the laser to penetrate the object. This penetration assists the LiDAR system in modeling a 3D sketch of the object. High frequency also allows the system to work effectively under inclement weather conditions. In contrast, the environment significantly affects the efficiency of RADAR. InnovizOne – one of the winners of CES Best of Innovation Awards – is a LiDAR technology equipped with the ability to detect objects as far as 250 meters from the vehicle. Owing to LiDAR technology, the device is resilient to harsh weather conditions. This gadget can track objects in real-time apart from detecting lanes. Moreover, it can also classify objects boosting the machine learning in transportation engineering. Such inventions ensure that auto manufacturing giants will be able to reduce accidents up to a remarkable degree. The machine learning in transportation business will soon allow complete elimination of vulnerability. Since 94% of car accidents involve human error, autonomous cars will significantly bring down the percentage of crashes. The transport industry is one of the chief stakeholders of GPS technology. Every driver with smartphone access may find the one’s pinpoint location in the remotest regions using the GPS. It does not require internet connectivity. Machine learning enhances GPS use by providing highly-efficient route optimization. Correct implementation enables the optimization algorithms to detect narrow streets and parking lots too. The AI in transportation ensures that the vehicle makes better route selection decisions without affecting the mobility of nearby vehicles. Finally, the data from all the sensors, cameras and GPS capacitates the vehicle to drive without driver’s assistance. Level-two autonomy also features cruise control where the vehicle moves without interference from the driver. However, cruise control can only be enabled in certain conditions. 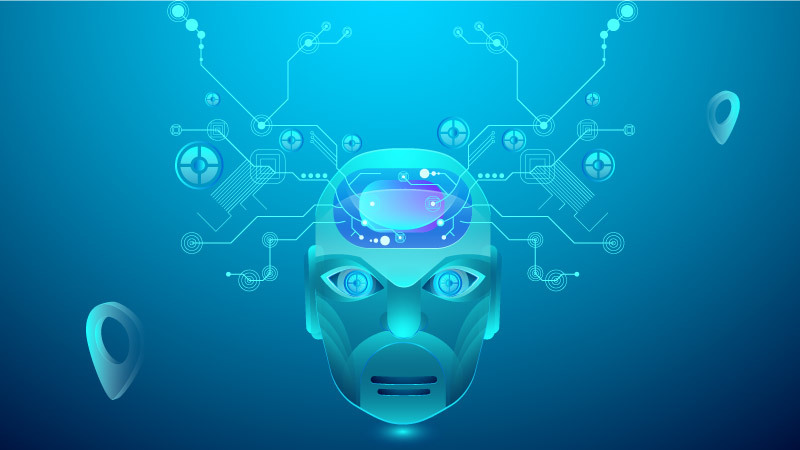 Although the application of machine learning in transportation fared very well, yet administrators and auto-manufacturers need to overcome a few shortcomings too. The RADAR sensors with 4-GHz bandwidth for 79-GHz frequency would be the ideal case for smooth running of traffic. However, most of the countries currently allow 77-GHz frequency with 1-GHz bandwidth. Nevertheless, regulatory framework is under development with a breakthrough expected soon. The improvement in LiDAR technologies is enabling the manufacturers to use the alternative option of RADAR. The logistics giant DHL announced the use of AI transportation logistics to inducing more stability to the fleet industry. Up to a few years back, consumers were reluctant to using autonomous vehicles for fear of collision. However, they are rapidly gaining trust. The introduction of Waymo in Arizona is a massive development causing a remarkable enthusiasm among travelers to utilize autonomous ride-hailing service. The governments around the developed world are devising a comprehensive framework for autonomous vehicle industry. Most of them already allow incorporation of self-driving vehicles in for urban mobility. Although contemporary transportation systems lack a shared environment, yet upcoming times are set to witness the distributed mobility mechanism controlled from centralized locations. This will allow efficient use of vehicles and will prevent traffic congestion. Machine intelligence in transportation is very close to achieving an autonomous urban mobility model. The rest of the tasks are only a matter of small time because most of the testing and requisite legislation has already been done. Meanwhile, investors have an unparalleled opportunity at their disposal to become one of the pioneers of autonomous ride-sharing service. Regardless of the amount of technical understanding, you can be the industry leader too. Sign up today to get going. How Technology Can Help the Taxi Industry? The technology and taxi industry are complementing each other which is gaining momentum day by day. The taxi industry caters for about 15 million commuters a day, that include workers, school goers, and women. It is the most used mode of public transport, which is making an estimated R90 billion annually. Technology has adopted by various taxi companies. Uber and Grab are big names that are getting great benefits using the taxi app dispatch solution. Seeing their success, different taxi companies are using taxi apps to boost their business revenue. Significant changes are undergoing in the taxi industry. Ten years ago, the norm was to wait for a cab to get a ride. However, technology has paved the way for massive change, influencing the entire industry. Now, businesses prefer using white label taxi dispatch solution. Many taxi businesses use CabStartup white label taxi dispatch and fleet management system as it is efficient and productive for managing taxi businesses. The taxi industry has become competitive because of the arrival of various taxi companies that are continuously rising in number to fill the rising demand using the white label taxi dispatch app. The use of technology is significantly contributing to dealing with the challenges faced by the taxi industry. The purpose of technology is to meet consumer needs by adopting latest technologies like Uber and Lyft, thus improving the taxi industry. These apps are becoming more convenient for smartphone users. Taxi companies manage their routes, fleet and keep track of their members for emergencies using these efficient ride-hailing apps. 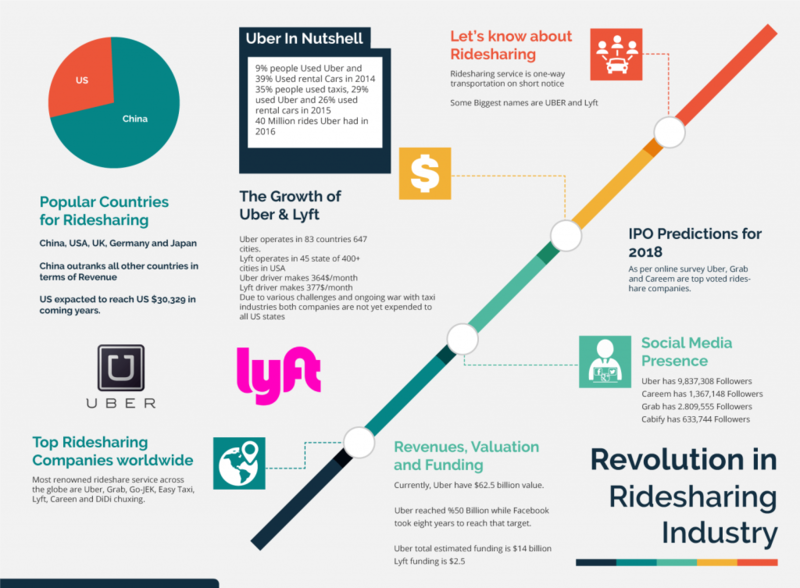 Ride-hailing industry estimated global worth is $108 billion. Currently, there are on average 15 million ride-hailing apps globally which are expected to rise to 97 million by 2030. The goal of Uber and Grab is to retain drivers and passengers by providing excellent quality service. Most of people prefer using them because of various benefits and convenience it offers. Their goal is to pick the passengers on time and drop them safely at the said destinations. Passengers expect a certain level of comfort from Uber, Grab or any other similar taxi company. 2. You can book a taxi either from your mobile phone, laptop or tablet. 3. You can cancel the booking if you don’t need a cab anymore. 4. You can share your route, details of the trip with your partners or friends if required. 5. You can book a taxi in advance for a few hours later ride. The introduction of taxi apps has seen a dramatic change to the old norm. The customer does not need to wait for long times as bookings are made on the phone using the taxi app. 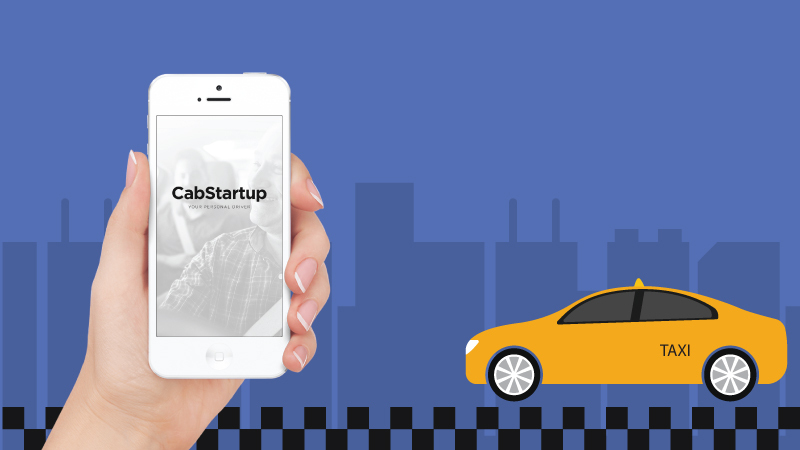 CabStartup has developed apps for some of the world’s leading taxi companies, helping them to stay competitive. It helps to book a taxi with an app, leading to a streamlined and efficient system for taxi companies. Driver app shows the nearest fares to the driver within a particular area. The app shows customer’s fare by considering the distance, time of day and traffic. Most taxi apps employ cashless payment methods like credit/debit card. With the latest payment technology, passengers can pay faster than ever before. 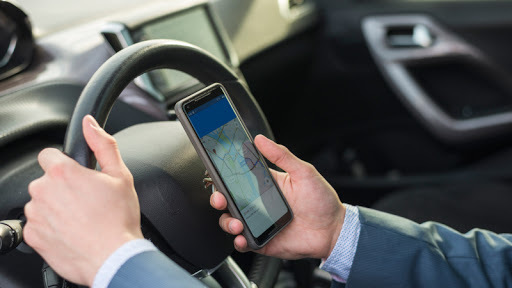 The calculation is completed before the driver has arrived at the customer’s pickup location, putting customers at ease over the price of the journey and ensuring a fair system for drivers. Taxi drivers submit their details to the company before providing their services. Their services are monitored in different ways. They are licensed professional drivers, therefore; taxi companies ensure safety of their passengers. The decrease in calls is most likely in a traditional system. On-demand mobile apps allows customers to get the services using the efficient system. It also decreases confrontations between drivers and customers. CabStartup implements a driver rating system to ensure drivers are professional in driving and providing customer service. It adds peace of mind for the potential passengers. Cloud dispatch system are the best examples of using technology that are helping business owners in bringing efficiency to their business and increasing revenues. GPS tracking feature is used in the fleet management system to locate its drivers. Drivers can pick the customers within two minutes. It is an automated system that offers a comprehensive solution in terms of efficiency and productivity. The taxi company gets an efficient booking system from a reliable mobile app development company to maximize their ROI. Taxi apps allow the efficient system, reduce journey time, increase safety, and improve the business flow. Technology enables the taxi industry to undergo a remarkable change. We provide a white label taxi dispatch solution for taxi companies all over the world. It is an efficient and comprehensive solution that can be customized according to the business requirements. If you are looking for a taxi dispatch app solution, Sign Up today! The Autonomous Ride-hailing technologies kept on buzzing in the halls of CES 2019 events. Many nominees including some of the winners of Best of Innovation Award belonged to vehicle intelligence category. The tech analysts are certain that the self-driving cars and the technology associated to it remain the focus of innovators. While many auto manufacturers displayed their autonomous cars, Ford and Uber grabbed most of the public’s attention. Perhaps, this is why both companies are highly featuring in the 2019 CES tech trends. This article looks into the ways in which the products unveiled by Ford and Uber at CES 2019 will revolutionize the urban transit systems in the near future. Ford revealed its autonomous taxi service plan a several months before the start of CES 2019. The automotive giant is set to evolve the concept of mobility to an entire new level. It projects to start the self-driving taxis by 2021. Although Alphabet Inc. already introduced the autonomous cab service in Arizona few months back, yet Ford carries more ambitious plans. Ford does not make the highlight of CES for the first time. The manufacturer also made to the headlines last year when it unveiled the Transportation Mobility Cloud. The leaders at Ford believe that this cloud-based platform is going to connected entire mobility system for urban settlers. Vehicles will be communicating with each other to keep the journey uninterrupted. This platform brings the world astonishingly closer to achieving the milestone of CASE – Connected, Autonomous, Shared and Electric – vehicles. A number of tech companies are raised by Ford to test the TMC. Many established companies are also partnering with the manufacturer. These companies come from a wide range of mobility channels. For instance, Spin – a company providing dockless scooters – is in partnership with Ford to add the utility driverless utility to this service. RideOS is another company currently in collaboration with Ford. It offers to facilitate the autonomous taxi businesses for their deployment. Chariot is a successful implementation of the TMC. This shuttle service enables the commuters to travel to work. Thus, the TMC enables the app developers to connect vehicles from every kind of transportation means. The widespread deployment of this platform will lead to one of the major accomplishments in developing the smart cities. Ford CES 2019 reinforce this assumption. The most intriguing consequence will be the end of private ownership of vehicles. Ford is on the way to creating an entire new industry without disrupting the existing ones. For instance, the car dealerships will still be operating. The only distinction lies in the fact that the purchasing parties will belong to ride-hailing services. In essence, there will be B2B sales between automobile dealerships and transporters whereas B2C sales will halt. Until now, Ford is yet to introduce its autonomous ride-sharing service. One can forecast the efficiency of the service by assessing the success of Chariot, rideOS and Spin. Ford is transforming the transportation industry in general and autonomous ride-sharing services in particular through its remarkable inventions. From bustling bus rapid transit systems to scooters roaming in the streets the impact is visible. Uber is one of the primary stakeholders of contemporary commute industry. It currently keeps presence in over 70 countries. The pioneering experience of on-demand cab service adds tremendous value to its credibility. The consumers, investors and tech enthusiasts expect the major stakeholders from every industry to share notable inventions. Thus, Uber is preparing to move multiple steps ahead. Its partner reveals, arguably, the most attractive product in the list of CES 2019 tech trends. Many analysts are predicting the massive vehicle traffic problems in the near future due to ever-increasing cars. The rate of increase in the number of vehicles is alarmingly high. However, the width of roads and alternate routes are not developing with the same pace as vehicle rates. The leadership at Uber is doing more than talking. Bell – one of the top partners of Uber – exhibited the flying vehicle named as Nexus. The VTOL-enabled aircraft is drawing widespread attention since Uber already announced to use this machine for their on-demand flying taxi service. Many commentators project the pilot-less aircraft to cause the same degree of transformation as the introduction of cars for commuting means. By mid-2023, Uber wants to launch the service. This launch will undoubtedly be a giant leap towards the development of smart cities. The electrically powered, connected and autonomous aircraft wins the support from a wide range of public and corporate circles. These crafts with six fan pods will improve the quality of air along with the CASE vehicles moving on roads. By the end of next decade, the urban settlers might come across more air-taxi vehicles than the road-based ones. The travel time will be significantly reduced. Many companies are developing software which ensures detection and classification of objects with precision from a considerable range. The embedding of these products will continue the motion of aircraft and vehicles without interruption. There will be no wait time to allow the other vehicle to pass. InnovizOne Auto-Grade Lidar is one such product that managed to win the CES 2019 Best of Innovation award. The 600 pounds Nexus can carry five people simultaneously. However, Uber is going to face many challenges before realization of this idea. The regulatory bodies are yet to approve this concept. They will decide after assessing all of the potential negative impacts on cities. They will also evaluate the security features by making Nexus to traverse millions of miles before its commercialization. Commuters also carry fear to travel by a drone. Uber and Bell face a fierce competition to grab the major share of market because many other companies are collaborating to provide air taxi. Ride-hailing industry is evolving with the advent of intelligent vehicles. There is a huge opportunity for the investors to own autonomous taxi businesses. To grow with us, start your free trial today. The global timeline of past two decades highlights the transformation of human civilization with the ethical use of digital technology. Smartphone, one of the most revolutionizing inventions, lies at the core of this evolution. The arrival of smartphones disrupted many industries. This advent allowed the software developers and entrepreneurs to make commuting easier by developing ride-hailing applications. 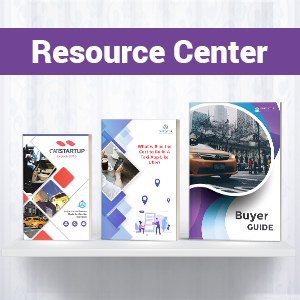 This concise introduction to ride-hailing ensures to familiarize the entrepreneurs with the business requirements and industry trends. North America leads the global industry by a CAGR of over 12%. Particularly, the United States is home to the most widespread on-demand taxi companies. Uber and Lyft are the top service providers, but other startups are also making gains. Uber is making fast penetration in every region of the world. Currently, the service operates in over 70 countries. The nearest competitor operates far from reaching Uber – operating in less than half of as many countries as Uber. However, the market share is huge enough that the industry is far from the saturation point. Although the US leads the world in developing the successful on-demand cab businesses, yet the most number of customers are in China. Owing to the massive potential, the local Chinese entrepreneurs are significantly investing in the business, and many of them have made substantial gains. Trailing the US, Indonesia also remains one of the chief contributors. Being one of the pioneers of on-demand taxi service is not the only reason for Uber’s success. In fact, few startups implemented the business model before Uber but failed to sustain the revenues. The main cause was the deficit in innovation and integration flexibility. Uber growth owes to the remarkable planning and implementation by considering the regional consumer’s demand. The market figures from around the world indicate that many countries will drift into the top markets by 2025. The emergence of Indonesia in the top three is the initial confirmation of this hypothesis. Any country with political stability and an average of at least 120 people per square kilometer keeps the highest potential for ride-sharing industry. Many countries with a sizeable population and satisfactory stability are demonstrating tremendous growth. Especially, Western Europe Middle-East and the Asia Pacific are excellent markets for startups apart from China and the US. Many locally developed enterprises are making remarkable numbers in these regions. Some of these businesses are outperforming Uber as well. Nevertheless, the on-demand cabs business will flourish in many countries regardless of local instability or a relatively small population. The success of the industry in North Africa, Eastern Europe and – above all – South Asia consolidate this assumption. The owners of taxi hailing apps need to ensure that they study the demands of local market before starting the service. If the service corresponds to the demands, the business is likely to expand. Owing to the lesser per capita income and massive unemployment, the ride-hailing industry also provides a significant number of employment opportunities. Thus, the administration of such countries is attempting to make requisite regulations. The effective legislation is not only providing excellent jobs to the locals but also enabling the commuters to mitigate their traveling menaces. The ride-hailing market of developing countries is disparate to that of developed countries. A primary difference emerges from a wide range of per capita income. The service providers offer a variety of ride-hailing options considering the varying demands in different regions. Urban Settlers of Europe and North America have the choices of sedan and hatchback. Some businesses offer vans too. The wealthy kingdoms of Middle-East also allow large operations. The presence of a considerable number of tourists ensures that the business earns remarkably. In any region, the economic disparity varies widely. Thus, many efficient service providers offer luxurious but expensive rides and basic but cheap ones in the same country. For instance, Uber renders business class services as well as three and two-wheelers in China, India, and the Philippines alone. This introduction to ride-sharing enables the aspirant businesspersons to decide about the variety of vehicles wisely. An insight into the successfully running ride-sharing systems indicates that, apart from choosing the region and types of vehicles, each successful business provides efficient smartphone app. A deficit of efficiency results in failure irrespective of the selection of area and vehicles. Following features of app ensure the best service provision to the consumers. 1. Interface of the application should offer easy navigation to various parts of the system. The consumers with least technical understanding should be the audience of developers. This notion follows from the fact that most of the riders lack technical knowledge. 2. Real-Time Tracking of drivers facilitate the passengers to track their agents in real-time. This facility allows the riders to estimate the arrival time and ensures to connect the passengers with the nearest drivers. 3. Payment Options should be diverse to avoid any delays. Many consumers in South Asia and the Asia Pacific require the option of payment by cash. Thus, the diversity will further simplify the services. 4. Feedback allows companies to improve their services by addressing the complaints and compliments of consumers. The commuters avoid sharing feedback if the steps involve a lengthy procedure. 5. Performance of software keeps the paramount significance. There are times when the influx of requests is high. It is annoying for the customers if the request fails to proceed owing to extraordinary pressure on the system. Are You Ready to Attain New Heights? This introduction to ride-hailing depicts an astonishing volume of opportunities. The analysts forecast that the revenue of this industry will become twice more than the current figure by 2025. Companies are also preparing for autonomous vehicle regulations to roll out driverless vehicles. The selection of an appropriate region with high business potential amounts to half of the business planning. The other half requires efficient software development and robust testing. If you project yourself as one of the top stakeholders of ride-sharing industry, sign up today. Our expert team will guide and assist you in building and consolidating the business. The contemporary inhabitants of earth are extremely fortunate to be alive in the current age. They are able to see vehicles running on steam, petrol, gasoline and electric charge. Currently, the technology is enabling them to see the autonomous or self-driving vehicles too. The taxi dispatch solutions are successfully making rounds for over a decade now. 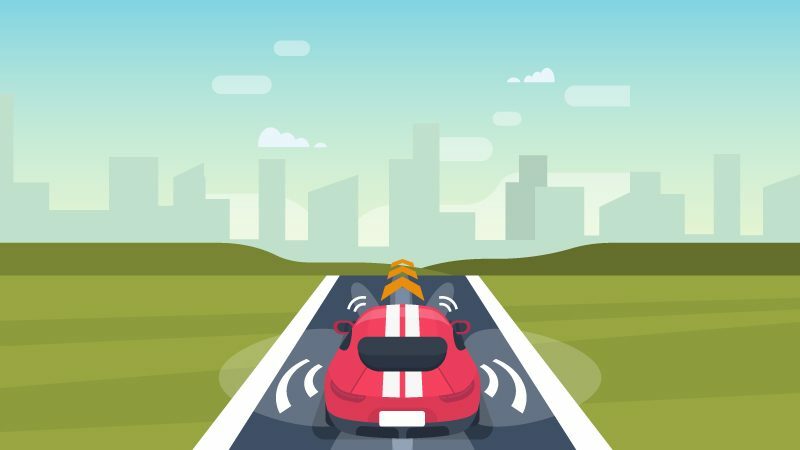 The researchers forecast that the commercialization of autonomous cars for ride hailing services will abruptly spread in 2019. Although legislation and regulatory framework for autonomous cars are still in the rudimentary stages, yet the technology has evolved up to the extent that it outperforms human drivers. The disruption in traditional taxi businesses caused by cab startup solutions will not end here. The advent of autonomous vehicles will further evolve and optimize the industry. The consumers carry some apprehension about the ability of software to be as good or better as human drivers. The surveys by Forbes indicate that most of the participants were willing to travel in self driving cars if the service provider offers a “considerable” compensation in case of an accident. They also want large scale use of fellow citizens before they would adopt it. However, the self-driving cars manufacturing companies are confident that they are going to win the trust of public. Waymo, an initiative of Alphabet Inc., partially launched the service last month for the residents of some counties of Arizona. The public response is overwhelming as a significant number people are willing to adopt this mean as their primary commuting choice. The riders welcomed the Waymo ride for comfort and reasonable fares. A 3-mile trip lasting for 15 minutes costs $7.59 as reported by Reuters. This cost is almost the same as Lyft and Uber. Another reason for manufacturer’s high expectations is the fact that the surveys conducted five years back with a similar set of questions indicated far greater level of fears surrounding the commercialization of autonomous cars. The experts believe that the substantial reduction in apprehensions follows the decline in the number of accidents of self-driving vehicles. There is a diversity of opinions among executives of on-demand taxi services, but most of them are convinced that a considerable amount of their business will involve the self-driving cars before the end of upcoming decade. The executives at Uber believe that Uber self driving car will be on roads before the year 2019 concludes. Although they plan to acquire the self-driving cars, yet they rule out the possibility of laying-off drivers. Uber wants drivers to keep the wheel when they sense an unprecedented and unusual behavior by cars. The tablets embedded in autonomous cars enable the riders to view the surroundings as the car “views” it. This ability signals the drivers if the ride is not up to the mark. However, the company also plans to phase out drivers in the long run once they develop efficiency beyond doubt in the automated vehicles. The number of employees will not drop because the continuously running vehicles will require more maintenance and, hence, more mechanics. Lyft also projects to initiate the autonomous rides before midyear. The company leaders believe that the complete transformation may take up to five years. It has already collaborated with General Motors to acquire vehicles, and tech analysts put the collaboration as a landmark in the concept of autonomous car sharing. While Uber and Lyft have already made a significant amount of investment, a bunch of other notable companies is also following the suit. Tesla is one of the pioneers who introduced autonomy in vehicles. Now, Tesla leaders are finalizing the autonomous ride sharing services. Since the company is manufacturing the vehicles, it is capable of rolling out and growing the autonomous taxi services faster than its competitors. Alphabet’s vehicles have managed to win the consumer trust in the partial release. The leaders project to attain a return of five times of their investment. Ford is all set to introduce their self-driving vehicles by 2021 and wants to invest $4billion by 2023. Nevertheless, the industry is not saturating any time sooner despite remarkable growth of investors’ interest. At the current estimation, the global investment of autonomous ride sharing is still falling short to fulfill the future consumer demand. Besides the traditional needs, there are scores of other benefits of investment in autonomous cabs. The electric vehicles will reduce the operational costs and improve the climate situation as well. Thus, the entrepreneurs opting for self-driving cabs to put their money will be capable of growing their domain to as big as over a billion dollar inside five years. Research at Allied Market Research forecasts that market of self-driving vehicles will top up to over $556 billion by 2026. Currently, the market worth stands at little over $54 billion. The increase of an astonishing 39% in a span of seven years reveals that the dominant share of vehicle industry will turn towards the autonomous vehicles. There is little doubt that the combination of autonomous cars and ride hailing technologies will revolutionize the taxi businesses. The only challenge is that of regulation. Up to 600 Waymo One vehicles roam the roads of 25 cities. These vehicles have already covered over 100 million miles with no significant accident reported. The cautious analysts believed that the vehicles would unveil shortcomings once tested in intense traffic areas. However, Waymo rides are proving the critics wrong since the Arizona launch. Apart from corporate giants including Tesla, Alphabet, Uber, Lyft and Ford, many small companies and startup entrepreneurs are also considering the investment. If these investors acquire robustly tested vehicles and fulfill the requisite safety measures, there is no reason for them to fail. As the trends indicate, the public trust on autonomous is bound to grow as the services will soon be launched in multiple cities of the US. Contact us to learn more about the autonomous ride hailing industry and the potential for investment. Our expert teams will help you in developing and expanding your business. The efficiency of the management system is the primary parameter which differentiates poor execution of business model from a precisely executed one. 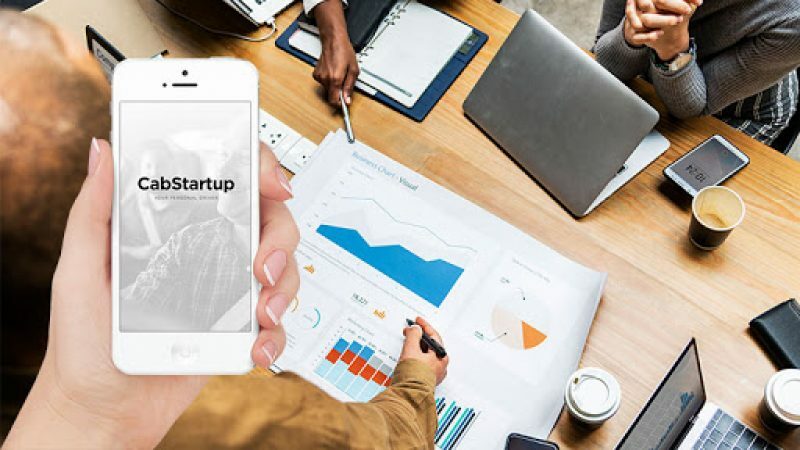 In a fiercely contested cloud-based cab startups industry, each of the significant players carries shortcomings in its service management framework. For instance, Shuddle and Taxi For Sure are two of the most pertinent examples. Each of these ride-hailing applications offered unique features like customized vehicles for kids and booking via social media applications including Twitter. However, the companies failed to sustain the pressure of requests due to incapable service management. The systems were built to address a minimal number of requests in parallel. They failed when the number of users abruptly grew in a matter of days. A deficit of precision results in failed business pursuits because the top competitors emphasize the most on this element. 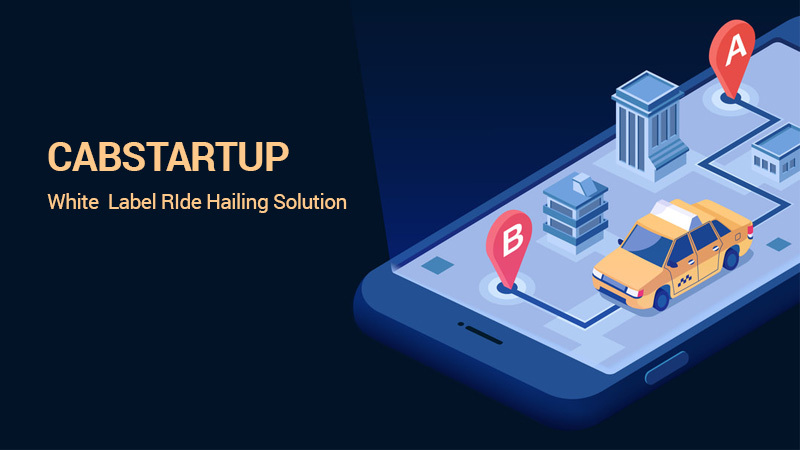 The success of cloud-based cab startup follows from the fact that the customers wanted a service which could pick them from their doorstep only by sharing the geographical location. Besides, they also wished to put an end to surcharges which were generated due to inefficient fare calculator. A cloud-based system with a robust artificial intelligence integration can identify the exact location of a customer. The system also runs smoothly without connection drops which ensure fair calculation of fare. More or less, each system works well in routine circumstances. Customers evaluate the services when an unusual situation occurs. An ordinary system will choke during high-pressure days like Christmas and New Year. The efficient taxi management app system will rapidly respond to the consumers regardless of the density of requests. It is intensely difficult to retain a customer who is annoyed by the service. Taxi For Sure did not have a deficit of drivers or vehicles. Instead, the software failed to connect the most suitable ride with the customer. Even Uber faces difficulties during peak commuting times but manages to retain customers because there is no service as good as Uber. Thus, the service which response in the quickest time takes the battle of winning customers. The traditional taxi service is obsolete because the companies did not have a strategy to store the data of customer and driver. Successful ride-hailing applications maintain a suitable number of vehicle availability in each area by assessing the number of customers. The frequency of taking rides is also a part of evaluating consumer behavior. A company is unable to examine the customer trends if it does not have the history of their past trips. By assessing the behavior, they can offer customer-specific packages. For instances, some customers commute daily. The system should offer discounts to such riders after forecasting the trends. The taxi app service technology allows customers, drivers and support staff to track the location of ride and customer in real-time. This tracking provides the estimated arrival time to riders and in-ride security to passengers. The absence of cloud platform restricts the businesses from such facility because the software running on commodity hardware cannot sustain massive workloads. The efficiency deteriorates, and the ride results in a miscommunication between stakeholders. An cloud-based cab startup without real-time tracking mechanism is as almost as ordinary as the obsolete taxi service. The most distinctive feature of any cloud-based management service is the ability of teams to work remotely. 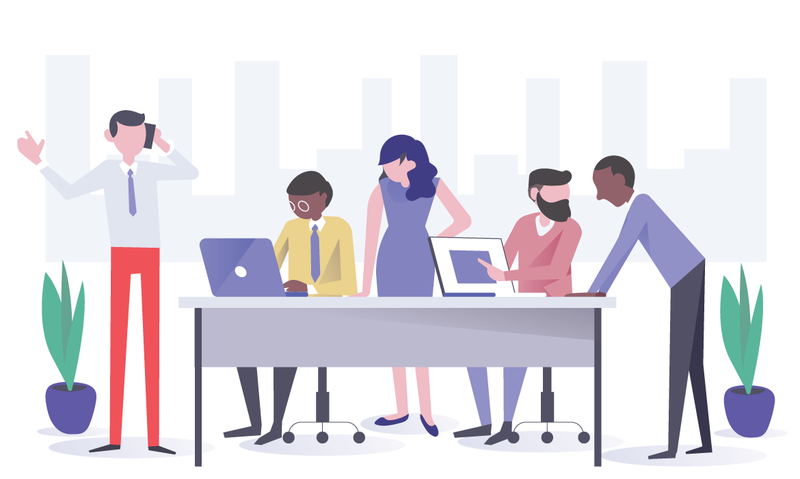 Since both data and processing software reside on remote servers instead of end-user nodes, the teams based in various locations of the world can collaborate and work to achieve the same goals. The changes made by a team at a workplace are visible to other teams too. This ability enables the businesses to address the region-specific needs. The odds of a system breakdown are close to negligible because the applications are distributed in a vast network of servers. If one of the servers fails to respond, another covering server addresses the request. Every digital platform requires improvements over time. The extent to which a system allows modifications and upgrading define its flexibility. The downloadable applications are also capable of software updates, but they increase the pressure on processors of end nodes. They also occupy unnecessary space in hard disk. Contrastingly, the updates and alterations are carried out on remote servers while using the cloud-based system. Considering the growing state of competition, the businesses need to remain multiple steps ahead of their competitors in evolving the system. Cloud technology also enables the companies to keep the system intact while adding new functionalities. This capability is essential to prevent the growth of an unwanted side-effect. Customer records and personal information are intensely confidential. Over the past few years, many companies had to pay substantial penalties because the customer data was not adequately secured. The compromise of integrity and confidentiality of records has made the customers more cautious than ever before. Fortunately, the architecture of cloud-based cab startups ensures a significantly high level of security. The access specification allows access to the authorized personnel only. While the users are unable to catch a data breach on a standalone computer as long as they do not find a set of missing or modified data, the cloud management tools share a breach attempt with concerned personnel as soon as one occurs. A strong idea sets the stage for the entrepreneur to create the business. However, efficient implementation is essential to sustain it. The success rates of cloud-based cab startups are significant to the degree that some startups have outperformed giant and established competitors by incorporating cloud platform. The only element which many of these startups offered was enhanced service management through cloud computing. You can be the next successful entrepreneur. If you intend to own an efficient cloud-based service management system, our experts can help you. Sign up today for assistance. 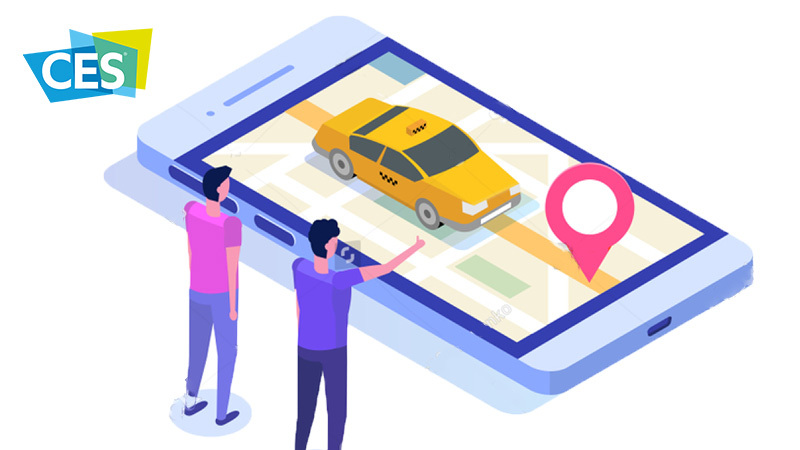 StorySaytaxi has been engaged in a transportation business for five years and developed status for being a reliable and affordable taxi company. The company shifted to Electric Vehicles aiming at the reduction of CO2-emissions. It has already produced some great results, that is a 10X boost in orders, and today 70% of its clients favor to book electric vehicles. Saytaxi is the first cab company in Albania that provides electric cars and runs a quick electric vehicle charging station. The company has grown to a pioneer of providing environmentally friendly car service in Tirana. Their mission is to replace cars with Electric Vehicles in the taxi business. SayTaxi worked several years to implement new technologies and advanced integrations. However, it wasn’t easier. The company employs marketing events to get some attention and attract customers as local people still prefer to call for a taxi rather than using their smartphone apps. The second concern was to increase revenue and decrease unpaid driven kilometers. Saytaxi got the services of automation solution providers. The software had all the required features they needed to manage and track drivers, and it was supported by a variety of marketing tools and a powerful support team. According to the Saytaxi statistics, usually, an Albanian taxi driver invoices only 20% of the traveled km. Saytaxi app increased the metrics to 80% as all the things get mechanized and streamlined. Ride-hailing white label solution is one of the most powerful tools any transportation entrepreneur can find today. It enables to manage the overall operation most reliably and transparently. It offers the feature of generating referrals, coupons and fixed trips, which is assumed to be a reliable marketing tool for our business. According to the survey report of more than 1000 U.S. adults, 87% of respondents wanted an electric car because they want eco-friendly environment. 62% prefer low operating costs, and 52% people prefer technology. The city of Tirana is leading the electric change. The actual market holds more than 1000 licensed self-employed taxi drivers. Their target is to switch at least 800 drivers from their used cars to electric cars, giving clean, sustainable taxi services for people across the city. People are amazed when a cab they have booked happens to be electric. The feedback of people is encouraging results in a 10x increase in order. • The car can cover about 170 miles on a single charge. • On a fast-charging station, it takes about 30 minutes for the 80% battery charge. At home, it will take about seven hours for a full recharge. Electric cars cost more than a taxi driver can support, so the company provides their drivers to give the vehicle lease with the money they save from going electric. Olger Hidri is sure that the lease options are affordable. The system in the form of Saytaxi app provides cloud hosting, enabling you to operate your company from any place in the world protecting money on IT infrastructure. CabStartup has succeeded in developing an outstanding platform, capable of altering people’s lives through real transportation solutions. It contains various features such as electronic fare calculation, different service types, live tracking through Google Maps, numerous payment methods, ease of access and management. Moreover, further features can be added to it according to your requirements. An increasing number of taxi companies are switching to environmentally friendly vehicles. We at CabStartup support that action and trigger other taxi companies to join the ‘green’ movement. We provide a reliable solution for the transportation business that can be used to streamline business operations. If you want to get a stable solution, Sign Up today. How Can On-Demand Booking App Automate and Enhance Your Taxi Business? The on-demand services and on-demand booking apps for businesses are growing so fast that people use the word ‘uberification’ of all on-demand services while talking. Uberification of services got so successful with the cab/taxi booking app used by Uber. There are more than 8 million Uber users over 70 countries. Getting a taxi booking or cab booking mobile app is the most suitable option. Uber, Lyft, and Ola are some top notch cab booking apps, and their reputation explains the efficiency and effectiveness among the users of these apps. 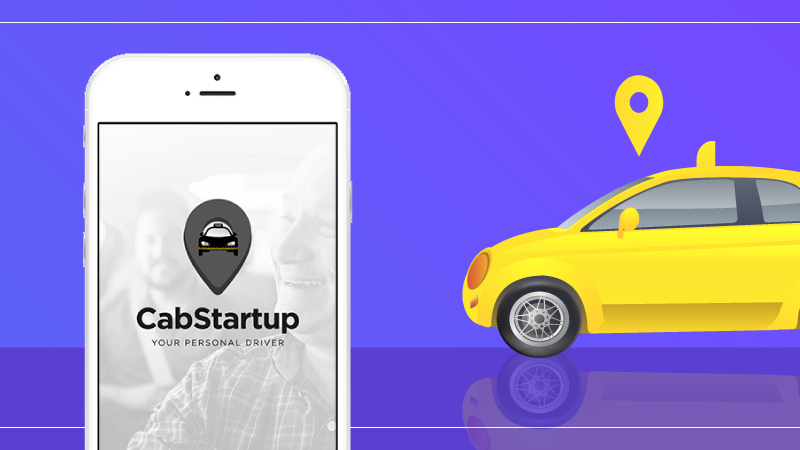 Developing Uber-like clone app and integrating it into your taxi business offers fantastic benefits. 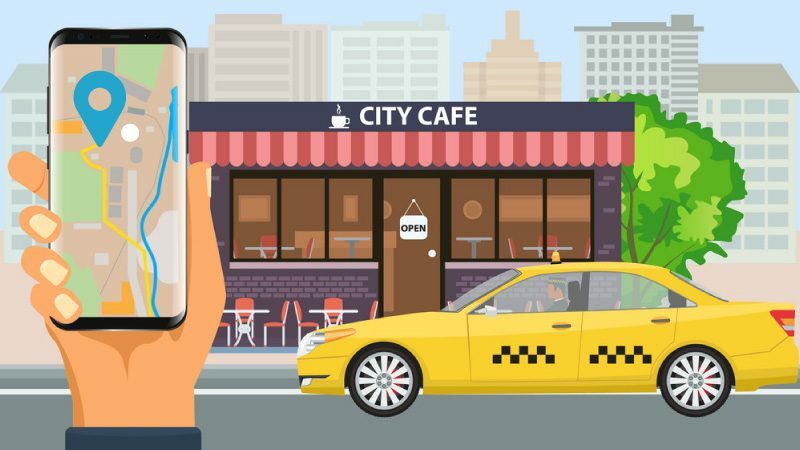 Getting a taxi booking app for your taxi services with customized features and your branding is locally and widely accepted and can grow your customer base and hence the business. 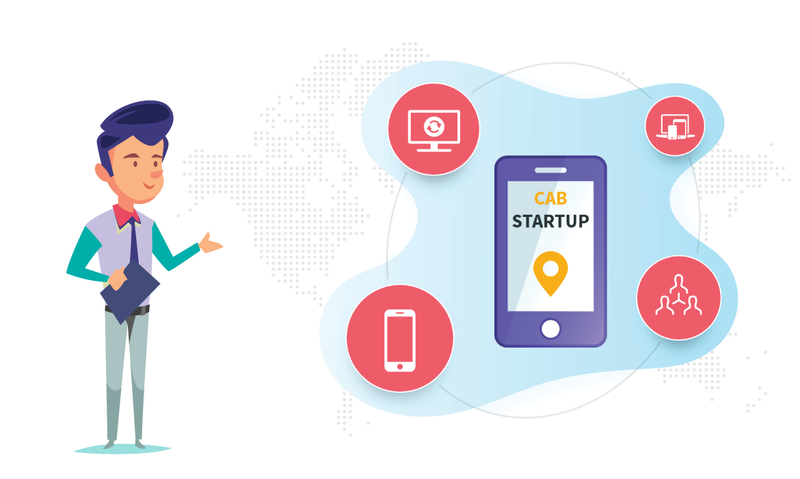 If you are managing a cab business at the local or global level, having a cab booking app for a cab service business is going to improve your business, if you plan your taxi booking app development carefully keeping in mind the overall business scenario. Developing a taxi booking app helps to streamline the taxi booking business and expand it by attracting more passengers. Let us check some benefits of getting a developed taxi booking app. Booking app brings automation and optimized efficiency to your taxi fleet business. It will help you handle your business with manual efforts. The app has different interfaces to manage passenger app and driver app. Mobile app on the customer mobile allows them to book your service as and when required without hunting for more service providers. Introducing a more extensive database with the app would support many people. Taxi apps can be developed with customized features as per requirement cost-effectively. 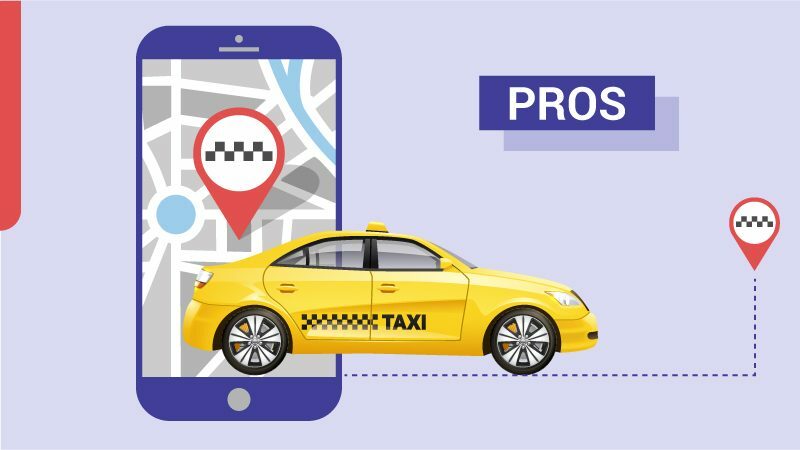 Considering the increasing demand for taxi mobile app development trend, here are the details related to improving the cab service using the technology. Whether you need an Uber clone app, or customized cab booking app development services to automate the cab service, our services are available for you. We have an expert team of taxi booking app developers to develop the booking app as per the client’s business needs. 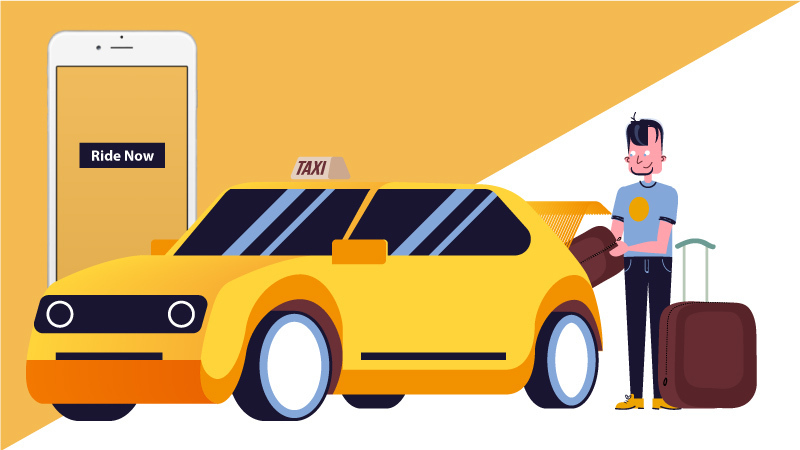 Taxi booking app or on-demand booking app consists of a set of 3 different software or app products, namely, one passenger app, one driver app, and one admin dashboard. The user can register on the app by adding relevant information on the login interface. Social media integration or email option allows users to register and login immediately. Using the booking interface, the user gives relevant travel details to book the cab instantly for travel. It allows calculating fare for his essential travel. The user will get a payment quote for booking a ride and choose the options available to pay within the app. Customers can pay via credit cards securely. The customer can leave the feedback regarding ride experience and driver. Users can be updated regarding booking status, car details, estimated time of arrival, etc. It represents the information regarding previous rides and also allows users to book the same trip with a few clicks. Driver profile is created after the registration with full-proof verification of their license, tax number. The driver receives the alert through push notification about new booking, payment, ride route details, etc. A driver can also accept or reject the orders depending upon his/her availability. It assists in finding the best route to approach the passenger destination. The admin dashboard is a software application that supports regulatory activities of passengers and drivers. The dashboard provides a general summary of all processes, and it offers features like trips, drivers, financial transactions, etc. When linked with Google Analytics, it enables you to monitor marketing activity. The admin panel supports you view all in-app activities, and it should offer a quick review of all processes. It also gives recommendations for best navigation for drivers and collects and builds the database of your clients to enhance the experience further. It is one of the critical functionality to find the nearest available driver within seconds. Once a cab is booked, the app shows the expected arrival time of the driver. It enables you tracking the rider’s location while the app is running in the background if passenger permits to share their location information. Maps are integrated within the taxi apps to navigate through the plan quickly. Drivers use the navigation features to reach from point A to point B. But if you are not operating on the global level yet, only simple location data sources will be required. For iPhone taxi app development, MapKit framework can be used. For Android taxi app development, Google Maps can be used. Maps have a representation of user’s surroundings. User’s location coordinates can be sent to the server, where they are translated into a readable address. Credibility among clients is essential for all business in which rating system can help. The reliability and trustworthiness need to be developed for drivers as well as passengers. It can be done by providing more and reliable information and by having a rating system within the app. Easy payment option is available if someone doesn’t want to pay in cash. Payment gateway integration is an easy option. Once the customer’s credit card is connected to the app, the customer can pay using a few clicks. But the customers who want to pay in cash also has this option. Mobile app for the taxi management service should be simple, effective and intuitive. It should be able to function smoothly and understanding data easily. The designs should be simple with a secure navigation system. Simple but intuitive UX/UI will bring the better and engaging look and feel to your mobile app. The cost of developing a taxi app depends on many features to be built, many functionalities to be integrated. The platform you choose for app development (iOS, Android, Windows, Web); features required to validate your ideas as Minimum Viable Product (MVP); and other functionalities that you want your app to do. The cost of a taxi booking app development rises from a simple booking app to a more sophisticated Uber-clone booking app. If you are interested in our on-demand booking app services, Sign Up today. What Is The Significance Of Investing In On-Demand Taxi Dispatch App? No doubt, the digital world has developed to produce more comfortable and better solutions for people. Amazing useful apps are available that lead the users right to the path of getting more accessible solutions. One of the domains that have pretty much successful is the on-demand apps. Since the time of their arrival, they have seen a rapid development because of the convenience they provide. The time of booking taxis by making calls to the booking agencies is age-old now.Taxi app software is helping the users by providing a safe and affordable ride. Users can locate the nearby taxi and allocate it for their ride. It might sound simple now, but it was pretty hectic to manage the endless number of calls for operators all the time. In the pre-cloud era, when the databases were not significant to manage all the complexities, the people had to install complicated taxi dispatch app software on their systems to make the auto dispatch management. The evolution of cloud computing and SaaS are genuine solutions for businesses to control complexities. All the software, server and the database are movable to cloud now. Everything is manageable now through a web browser, making the process simpler. It is the method for on-demand dispatch apps! Cloud-based on-demand solutions are not limited to taxi industry only. They have reached to the retail sector, private car rental, healthcare, fitness, and restaurants, which are expanding day by day. Benefiting from the on-demand taxi dispatch app has become more comfortable now. These apps have become the fastest approach to give services in various forms. The rise of Uber was not an overnight process. It was one of the first prosperous areas of taxi booking applications. Now, the entire taxi dispatch system is the current favorite of both businesses and users. It is an ultimate level of ease in booking a taxi. With push notifications, you can enhance the performance of your business for both cab drivers and the users. By monitoring the overall booking requests, productivity and efficiency can be improved. A more natural booking process can increase the Quality of Service. Interfaces are essential, by adding great features, many users can be increased. Features like calculation the fare before the ride, multiple payment options are more useful for the users. As a taxi business owner, if you have not signed up for getting an app for your business until now, you might be facing some problems. Managing a taxi company is not so easy as there are multiple aspects to look over every day. Assigning drivers to the passengers, ensuring their availability, and various other things need to be managed at the same time. Users are likely to shift to better options if the service they want is not immediate. Now, on-demand taxi dispatch app is the best solution to manage taxi services efficiently. Examine this, a rider calls for booking a taxi, check the availability, put up the location and complete the process, the entire process takes at least 15 minutes. And, customers are prone to shift to an app that would quickly support their need. In this technological era, businesses need to adjust themselves to the changing needs of consumers, which entirely depends on convenient solutions. Every person is looking for more comfortable and efficient solutions like on-demand taxi dispatch app for Android and iOS, which has become mandatory. If you are interested in automating and streamlining your taxi dispatch app process, then Sign Up today for all your specific taxi app solutions. The efficient utilization of time and money is one of the primary objectives of frequent commuters. Subways, bus rapid transit (BRT) systems, and taxi services provide very limited means to achieve these goals. The BRT is cheaper but consumes more time since the commuters rarely find a bus at their doorstep. Taxi services save some time of travelers but are expensive to be considered. In such circumstances, the bike taxi service is the most effective solution which renders an excellent alternative to the traditional commuting options. In the presence of such a service, the users find a bike at their doorstep in less than 5 minutes once they schedule a ride. Moreover, one reaches the destination in relatively lesser time and at an impressively affordable cost. The bike taxi software is as valuable for the service-provider as the users. 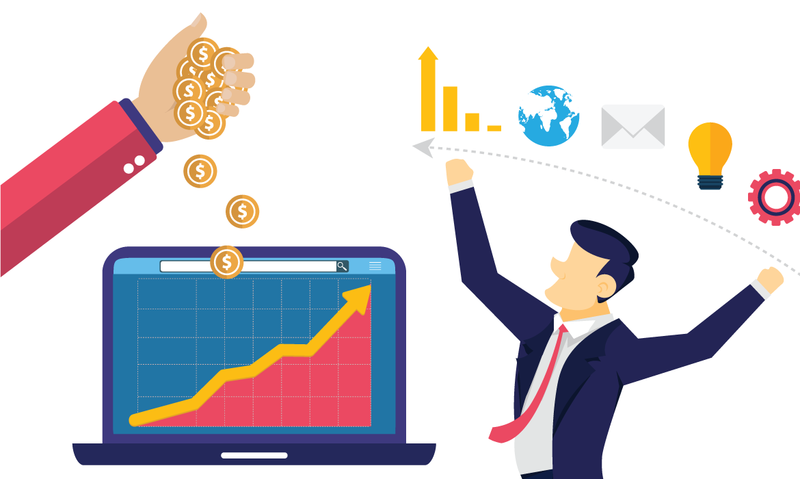 Following are some of the ways which attract the entrepreneurs in every part of the world to invest in such software. May it be a bus service or taxi; every traditional commuting service-provider needs to make a considerable investment to initiate the business. The costs of accidents and vehicle maintenance are also significant. However, bike taxi management software requires little investment while the return on investment is exponential. The startup does not need to purchase bikes since it can have private bike owners to serve the company. The bike owners are also responsible for its maintenance and accidental coverage. Furthermore, bikes consume considerably less amount of fuel as compared to any of the other commuting choices. The growth in technology has reached such a remarkable degree that the modern software rarely requires humans for its operations. Artificially intelligent cloud-based taxi management software does most of the job using efficient algorithms. Thus, the rider and passenger can easily communicate with each other. While the team collaboration increases by remote access of data, data management also becomes easier once the business adopts cloud-storage. The cloud-based services increase the efficiency by providing enhanced data security and remote access to the databases. Such systems are capable of running automatic updates and are sufficiently flexible to allow integration of new features. They also ensure real-time connectivity between passenger and service providers while commuters can track the ride in real-time. The business of on-demand taxi service is still rudimentary. Bike-sharing apps are particularly rare. Global trends indicate that the contemporary times are the most favorable to initiate on-demand bike taxi service as there is a massive gap between demand and provision. This demand is only set to increase in the upcoming decade as travelers are looking for resource efficient means to commute in the excessive traffic in cities. After the introduction and success of ride-hailing apps, bike-sharing software can grab the major chunk of market potential. The service is equally feasible for the inhabitants of developed countries as the developing ones. The statistics from Germany, France, India, and Thailand are sufficient to prove this claim. The reputation of a firm is one of the chief causes of public attraction. Companies allocate a substantial budget to advertise their services for the social good. Bike taxi schemes are already receiving a great response from the public for being environment-friendly. Bikes have least carbon footprint and save a significant amount of fuel. Another reason for an overwhelming public response is the escape from traditional traveling means which do not only eat up the time and money but the commuters’ energies too. Bike-riding services facilitate the customers with just a few clicks in the comfort of their homes instead of walking miles in search of an appropriate ride. 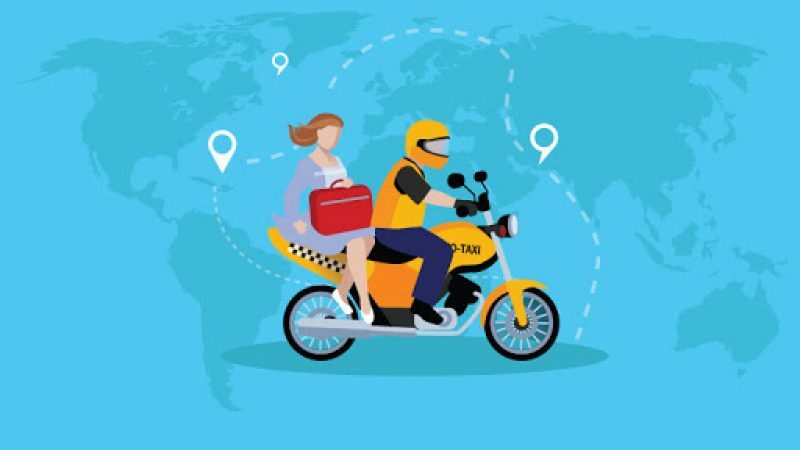 The potential startups have a unique opportunity to initiate the business and attain a cosmic growth in a matter of months because the bike-sharing industry does not see as fierce competition as other industries. The probability of failure, if ride-sharing management software is adequately efficient, is insignificant. The research from credible statistical firms depict that the industry does not face saturation as the demand is colossal while service availability is intensely rare. Even the existing services are far from efficient due to the absence of useful cloud-based software. This scenario invites the new business aspirants to fill the void and obtain one of the top spots in the transport industry in general and bike taxi services in particular. The excessive number of data breaches prompts the businesses to win the trust of users. Research reveals that the software lacking cloud technology is highly susceptible to violations. In the ride-sharing industry, the companies maintain the records of customers as well as the employees. This is essential to avoid the repetitive task of sharing the information each time when one intends to schedule a ride. A malicious penetration into the databases can cause immense inconvenience for the riders. Thus, cloud-based software is the most appropriate solution for bike taxi services. The software is capable of immediately catching any attempt at violating the availability and confidentiality of data. If one somehow succeeds in corrupting the data, the efficient backup schemes recover the original content. The bike ride-sharing apps serve a precise cause of bringing down the unemployment. The people from lower socioeconomic classes earn a respectable amount of money. Thus, this win-win situation for employers and employees as well as the customers is helpful at many levels. The demand for commuting media is vast enough that bike taxi service barely threatens another transit mean. Thus, the entrepreneurs can fulfill a social responsibility while running an efficient business. Owing to the exponential rate of increase in demand for commuting channels, the business aspirants have an unparalleled opportunity at their disposal. One can start the bike ride-sharing service without any technical background. The initial investment is small, but the outcome is incredibly significant. By incorporating the advanced cloud-based technology in software, the success can be ascertained. We provide immaculate cloud-based mobile-app development services. Sign up today to acquire reliable services delivered by our expert team. What Are the Pros of Branded Taxi Apps? 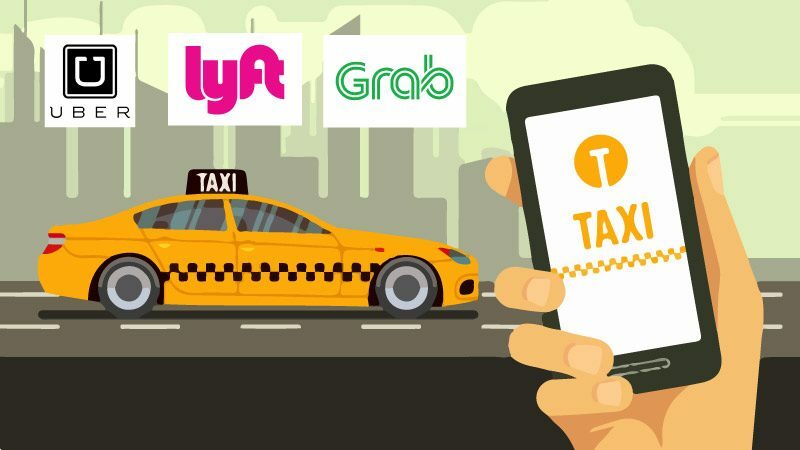 Fierce competition in the ride-hailing business and taxi booking apps like Ola, Uber, and Lyft have produced severe challenges for the taxi and transportation industry. With their mobile apps, hailing a taxi is now just a few taps away! Traditional Taxi businesses are facing hard times as their customers are shifting towards app-based cab hailing services, which offer an improved cab booking experience. While many taxi and cab companies are still stuck with inefficient phone call bookings. On the other hand, competitors are using real-time booking platforms. Statistics show that taxis lose at least $20 million on everyday basis just because passengers are unable to find a cab. 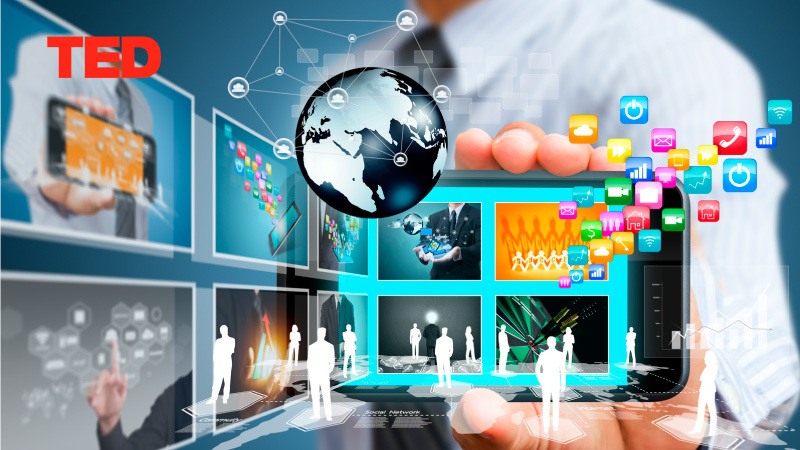 It is compulsory for the success of any business to adopt the new technologies. In the era of mobile phones, a branded taxi app can take your business to the next level as compared to the conventional method of doing taxi businesses. The electronic system makes it capable of offering rapid mobility services. Investing in taxi app development has become crucial for taxi operators. It assists the passengers and connects them in real-time with your fleet. A white label mobile app gives your taxi business full visibility among customers that increase customer base. People prefer using taxi apps to get cab services. It has become mandatory for every taxi business to have a mobile app as taxi businesses lose customers without having a mobile app. Many taxi operators and drivers who are using apps are enjoying the pros of branded taxi apps in the form of higher profits. A ride-hailing company can develop his or her app with the help of app development company, save on commissions and enjoy the pros of branded taxi apps. A taxi booking app used by your customers connect them with your drivers in real-time via a driver dispatch app. It offers a better booking experience for your customers, boosts driver performance and reduces the overhead costs, which is much higher in the traditional or manual taxi business. It is now possible to get your taxi app to get the added benefits of branding. Taxi companies can get the app customized to meet their specific business requirements with essential features and combinations. They have open the doors to modernizing your taxi business. Investing in a custom taxi company app will boost your business and improve customer’s experience. Customers download the app on their device by registering and sign up. They can see the available drivers near their location while booking a ride. An interactive map enables passengers to track the driver in real-time. Multiple payment options are available that will allow riders to travel around cashless. Drivers register and sign up the trip requests immediately. They can confirm the pickup location in less than a minute. The driver has an option to accept or reject a ride depending on his availability. Advanced booking request options are also available. Real-time alerts are sent to both customers and drivers before the pickup. The taxi business owners have to access the master admin panel to manage your fleet and drivers. They can monitor and view drivers on a real-time basis, allowing efficient management. There is the option to ask your customers to rate their driving experience, leave feedback, and see your driver’s driving history and more. Customers calling for booking a taxi is an age-old method of taxi service. 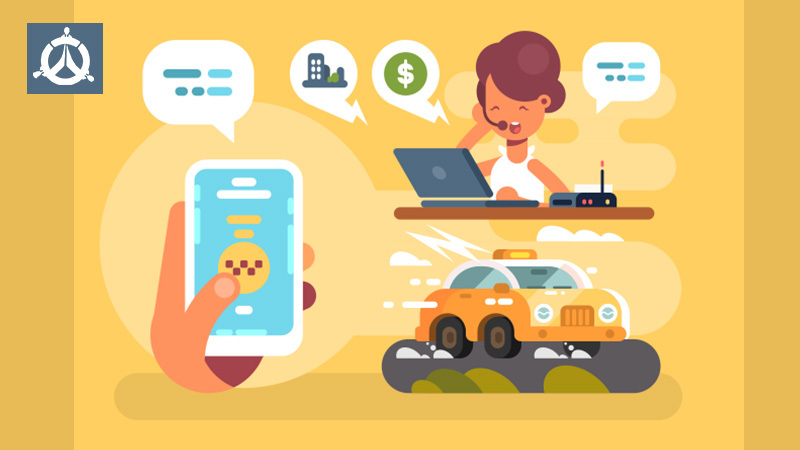 In the advanced era, the mobility and internet are embracing the latest technologies for taxi booking to stay competitive and grow your business. A potential customer calls for a pickup, confirms a reservation and then get the services of your taxi. The entire process takes a few minutes. Your customers wait for long periods. Customers require speedy and efficient delivery in the minimum time. Taxi booking and confirmation do not take more than a few minutes. Branded taxi apps boost driver productivity and bring efficiency. Branded apps allow giving feedback that drives profitability, which is not available in traditional taxi businesses. In the taxi app, you can monitor the driver’s performance, boost the productivity of your business and give feedback on the ride. Without an app, your drivers may spend a lot of idle time on the roads looking for passengers. Using an app, it becomes possible to boost driver efficiency. Therefore, drivers are optimally hired, and passengers do not wait for several minutes. Branded apps help in real time connectivity as drivers are aware of their passenger’s pick-up locations. With the real-time connectivity, drivers and passengers are aware of each other’s exact location. • Enhance customer experience by reducing booking time. • Streamline the business operations. • Improve driver productivity and revenues. If you are running a taxi business, do check our taxi app development solution. We offer branded taxi apps for transport businesses to manage your fleet operations and boost your taxi business. Our experts deliver a customized solution for your taxi business according to your essential features. For quality taxi solutions, Sign Up today.